Can I exclude Private posts from the Post Grid? Free and Premium WordPress Plugins & Themes Forums WordPress Plugins Content Editor Can I exclude Private posts from the Post Grid? J. Davis 1 year, 3 months ago. Trying to use the post grid to list some posts but want exclude certain posts be Tag , Category and/or if the are marked as private. Is this possible? How do I do this ? Thank you for your question. You can achieve this by using post queries. 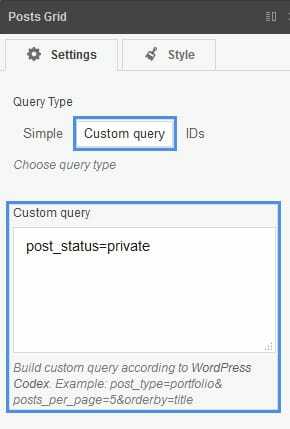 You can add it when you switch to Query Type > Custom query in Posts Grid.